Your Retirement Vision–Does It Include Your Dreams? Have you really taken a step back and thought about what you’d like to do during your retirement? While it’s OK to sit back and enjoy that Bingo game, you may want to consider something more challenging from a physical (if you can) and mental standpoint. It might be time to do a bit of soul searching and re-visit a hobby that you were passionate about, or find a new one. I “retired” from my hobby of tap dancing for 20 years. Eleven years ago, I returned to it because I was forced to participate in a mandatory employee talent show at the retirement home. I can’t pull rabbits out of a hat or tell jokes, so I returned to the only thing I knew well. After resuming my lessons, my teacher encouraged me to enter my first competition at age 43. I won a gold medal! At age 49, I won my first platinum medal while competing against 25 women who were less than half my age. I was named by the judges as the overall winner out of 300 contestants. Competing was tiring from a physical and mental standpoint. Yet, I felt a sense of satisfaction from the challenge. During the same year, I was cast in a small part in The Nutcracker. I’m 51 years old and teach tap and ballet to children on a part-time basis. I watch my students compete with the same sense of pride (and an occasional tear) as when I was competing. I was able to realize a dream that subconsciously I didn’t know I had. I now teach tap and ballet to Alzheimer’s residents. I know that having such a wonderful experience during mid-life is unusual. However, it brings a few points to mind. First, I wasn’t too old to pursue something I was passionate about. Neither are you! Second, dancing is a fantastic form of exercise. Third, executing the steps made me use my brain. Alzheimer’s studies suggest that a variety of types of exercise are helpful to the brain, so consider joining a walking club, try some strength training, or go dancing if you can. You don’t necessarily need a gym to tone your brain. Mental exercise has also been associated with a reduced risk of getting Alzheimer’s. So consider taking a class, play memory games, read or work puzzles, or simply talk with a friend. Everyone should set aside a few minutes each day to think about his or her vision for retirement. You might want to pursue an old interest, or try something you always wanted to explore. Your vision for retirement is your vision for happiness. Have some fun. And if you are considering a move to a retirement community, please scrutinize the activity schedule. Your dream and their activities should be on the same page! 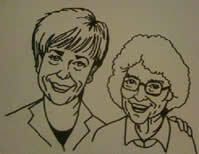 I was recently blessed with an opportunity to consult with a 75-year-old woman and her daughter. My client was independent, living alone in a condominium, driving her car, and suffering from back problems. She had lost her husband approximately two years ago and admitted she was lonely. She wanted to move to an active retirement community that had a pool, but would be close to the meeting place of her bereavement group. The daughter and her mother hired me because they had written for brochures, attended senior fairs, and were thoroughly confused about the myriad of options available to her. A Lifecare community that included a continuum of care (independent living, assisted living, and skilled care) in case she would need more care. This option requires an entrance fee that would help to underwrite the costs of future care and payment of a monthly fee to cover meals, maintenance of the grounds, and other costs of living. A change in level of care would not change the monthly fee. The entrance fee is 90 percent refundable upon moving out. A second continuum of care community that had no entrance fee. A change in level of care would mean an increase in the costs of care. However, all three levels of care were available in the same building. Two communities that offered independent living and assisted living but would require a move to skilled nursing if she required that level of care. During our meeting, I asked her a number of questions, including whether she had a vision for her ideal retirement community. Aside from the initial requirements, she mentioned that her previous employment required computer skills. She would like to volunteer either to help in the administrative offices of the new community or teach computer skills to the other residents. I knew there were similar opportunities at some of the communities I recommended. Have you thought about what you may be giving up when you move to a community? The rooms will be considerably smaller than the condominium you own now. Have you thought about which items of furniture you will keep? Have you thought about tasting the food at the communities? You may be spending up to 30 percent of your time eating. You must test the food before signing on the bottom line. What if you don’t like the other residents? Have you thought of the possibility of sharing meals with people every day? You have the possibility of living next door to someone whose habits you don’t like; i.e., door slamming, noisy habits, etc.